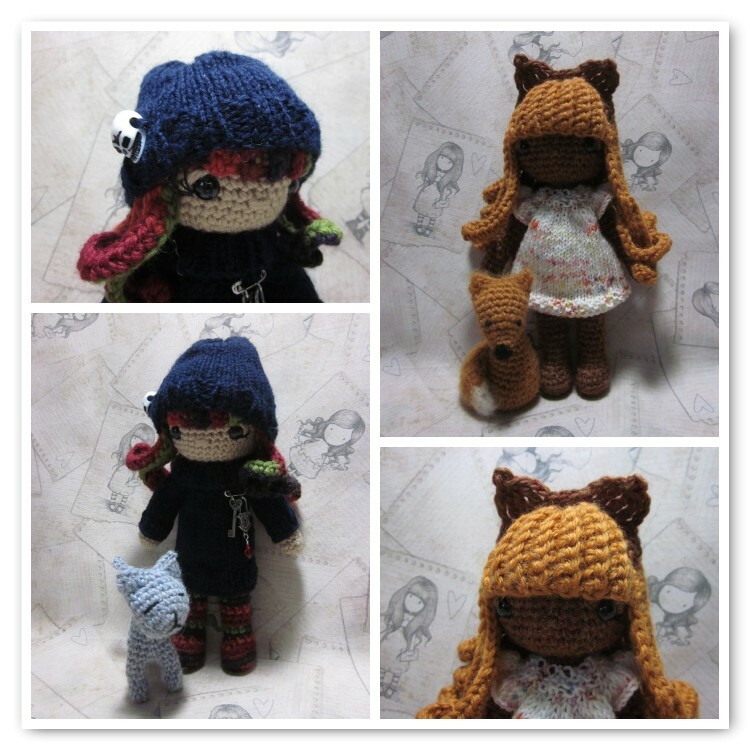 My latest crochet obsession is a pattern which is freely available from Ravelry. It is Laura Tegg's Weebee doll. 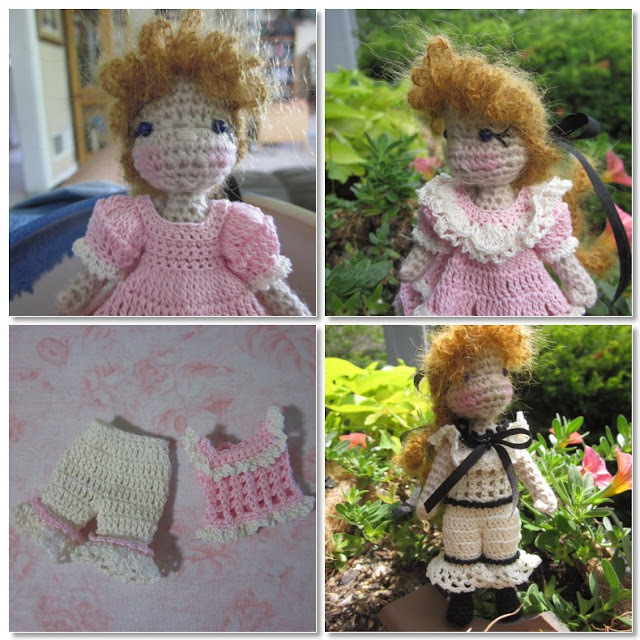 Not only is the doll pattern free, but Laura has several clothing patterns for free as well, in addition to some paid patterns. 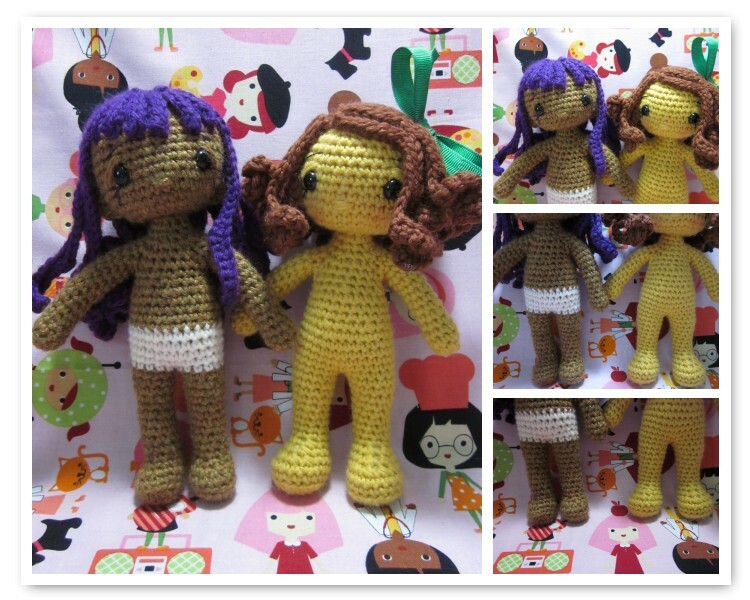 My dolls were made with Knit Picks Brava Sport and a size C (2.5mm) crochet hook. They are about 7.5 inches tall, with adorably large heads. 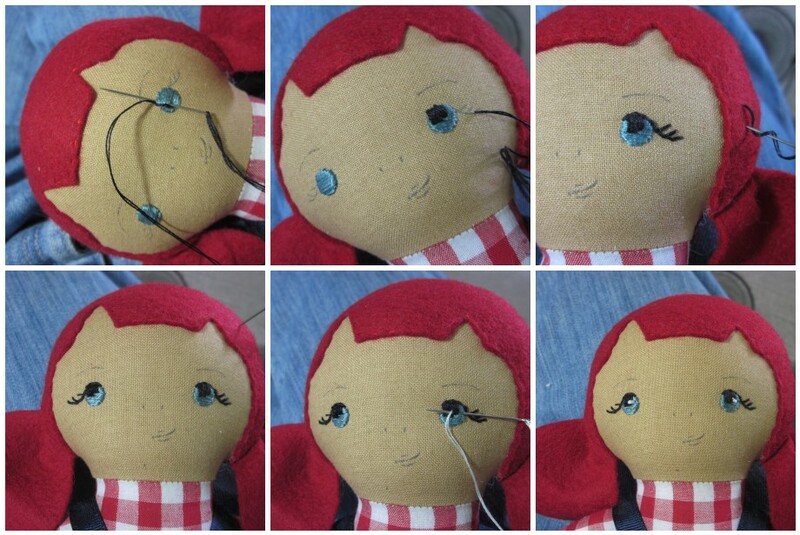 I like to make my dolls with move-able heads, so below you will find a picture tutorial for how to do this. Almost any crochet doll pattern can be adapted to make a move-able head. 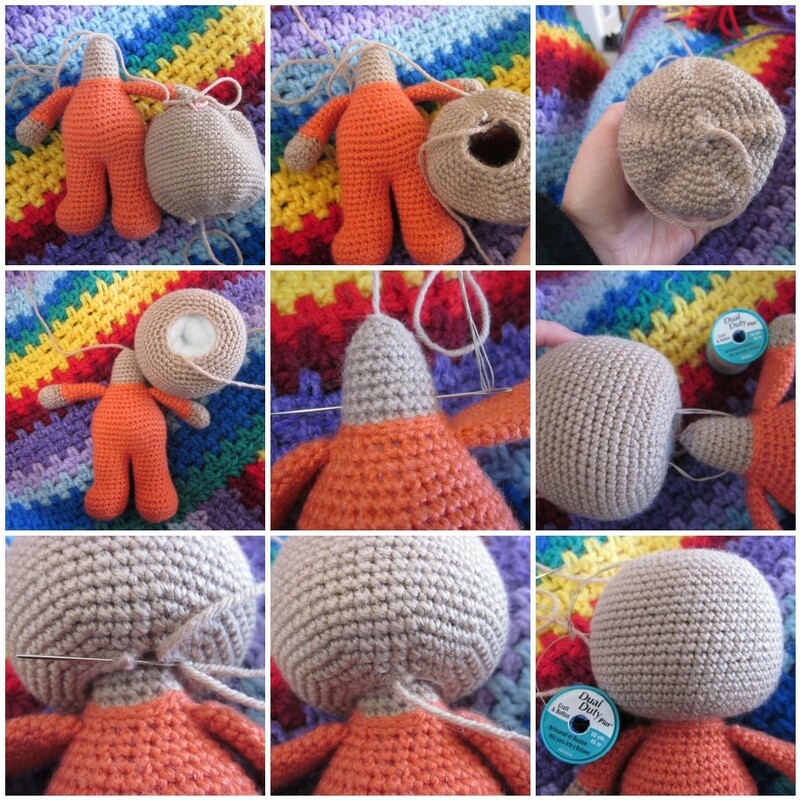 In this case, this is Laura Tegg's Weebee doll pattern with a move-able head. Simply work the body pattern as instructed to the point just before you increase to make the head. Instead, make a neck stub seven or eight rows long, tapering the last two rows as shown above. Make the head separately beginning at the neck end with an opening that fits snug over the neck stub (same number of stitches as the neck stub before you taper it). Join in a ring so you have an opening at the bottom (as shown in the middle image at the top), then work the head increases as written, closing the opening at the top of the head (as shown in the upper right image). Stuff the head firmly, but make a hollow up the center that you can insert the neck stub into; the fit should be very snug. 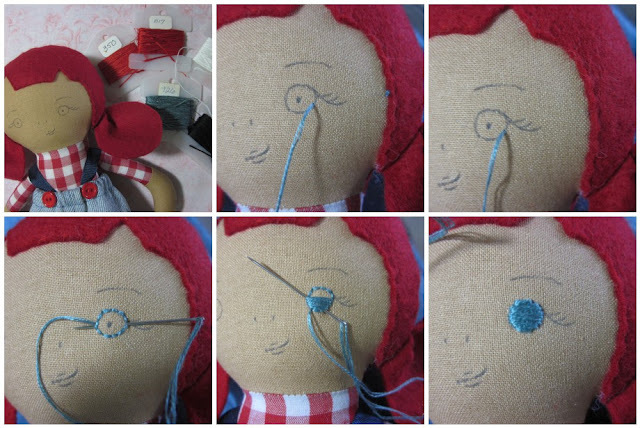 Joint the head to the neck with four strands of craft or carpet thread and a dollmaking needle, as illustrated in the middle row of images. Tie off the carpet thread at the top of the head with a secure double knot. The wig cap or hat will cover this. Finally, take the yarn tail from the beginning of the head and join to the first stitch of the head at the neck opening and pull tight. Bury the yarn end in the head. Olive and Owen and I wish you all a happy new year; filled with the blessings of crochet and kindness! May your holidays be filled with joy and family; kindness and compassion. 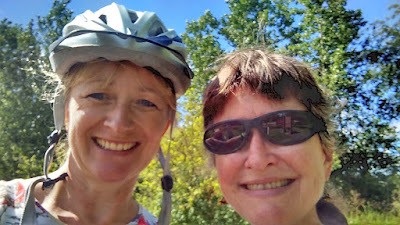 On the trail of Giant Rainbow Snails is Columbine Duskywing, fearless freelance Malacologist for Hanover College, along the banks of the Ohio river. Columbine is the daughter of Professor Horace S. Duskywing, head of the department of Invertebrate Studies at Hanover, an eminent Lepidopterist, and in 1869 elected chairman of the Society of Kentucky Lepidopterists. Not having strong maternal instincts, Lady Acadia left most of the childrearing to her husband; a gentle academic with a vague fondness for this unexpected daughter. He provided few rules of behavior, a shocking oversight in Victorian society. He expected obedience, respect, and curiosity; he gave affection, and unlimited use of the university libraries. From an early age, Columbine could be found sitting, crosslegged as often as not, on the dusty floor of the library, nose buried in some book of natural history or exploration. Marco Polo! Amerigo Vespucci! James Cook! Charles Darwin! Great stories of discovery, but no women. Dust motes shimmered in the pale light of the one window in the library, but Columbine did not see them dancing. No women. Couldn't women discover a continent, or a new species, or sail around the world? There was Ida Laura Pfeiffer, the Austrian woman who had traveled (twice!) around the world, documenting plants, minerals, and mollusks as she traveled, but no other woman on these library shelves. Quite unexpectedly, Columbine's mother realized that at 18, Columbine was quite a lovely girl, in spite of her shockingly unconventional behavior. The only interest that Lady Acadia ever bestowed on her offspring was to plan her coming out season and ball, much to Columbine's dismay. Columbine simply could not bear to be squeezed into a corset, and paraded to polite society like a prize broodmare. Ugh! So quietly, on a clear but moonless night, Columbine packed a small rucksack with her precious books on invertebrate zoology, journal, magnifiers, a spare shirt and a bar of soap, and some jewelry she would never wear. 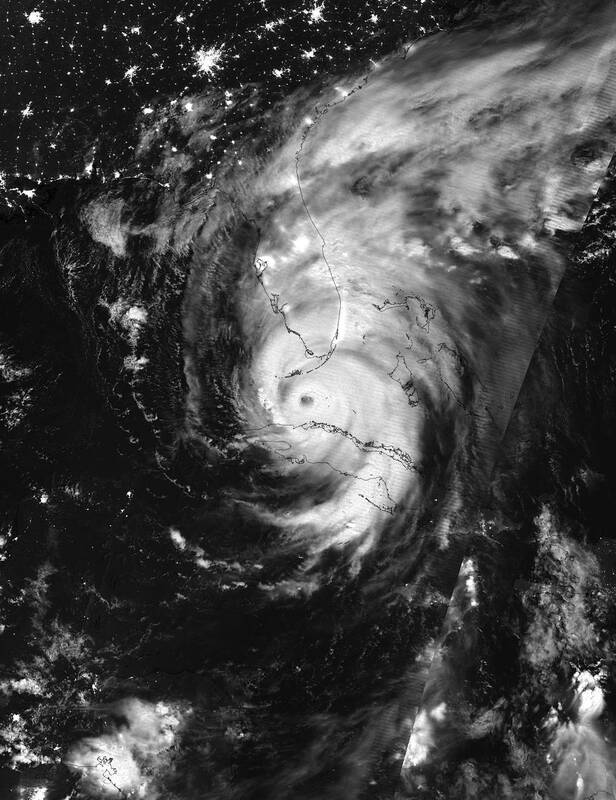 Dressed as a laborer, she climbed out her bedroom window with the false dawn, and headed North. Looking for Rainbow Snails and Adventure! Looks like she found them! My dear friend and kindred spirit, Joyce, coined this word. Frankensteining: verb; to create a doll from elements of several other doll patterns. Which is what I've been doing lately, and like the good doctor for which this verb is cognated (probably also not a word), I am well pleased with my final version. This doll is a combination of the freely available Eva doll (available on Ravelry), the purchased Jane doll (available on Etsy), and my own Simply Ami doll, (available here on this blog), plus a bit of body tweaking. 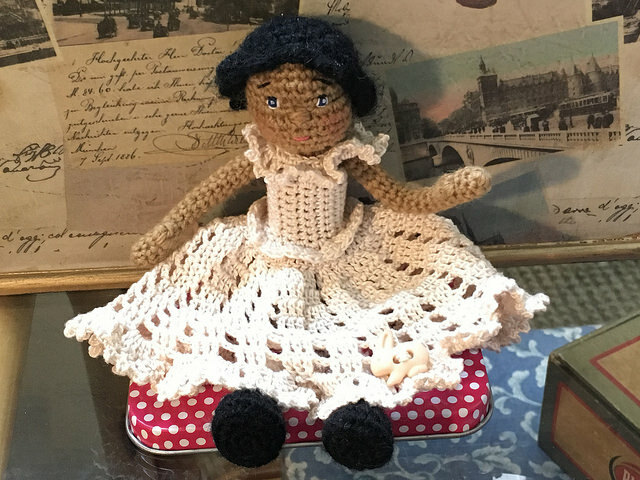 The point is, if you have been making dolls for a while, you probably have a nice collection of patterns, and certain attributes of each doll that you particularly like. Don't be shy about combining the bits you like to make a doll uniquely your own. But keep in mind that this is not pattern design, and that credit to the original designers should be given. So thank you, Jessica Doering, for the Eva doll that provided the size; Kelly DeSandro for the Jane doll that provided the shoulders, head, and dainty feet; Simply Amis, for the swing legs, and my own tinkering for the body shape and wig. 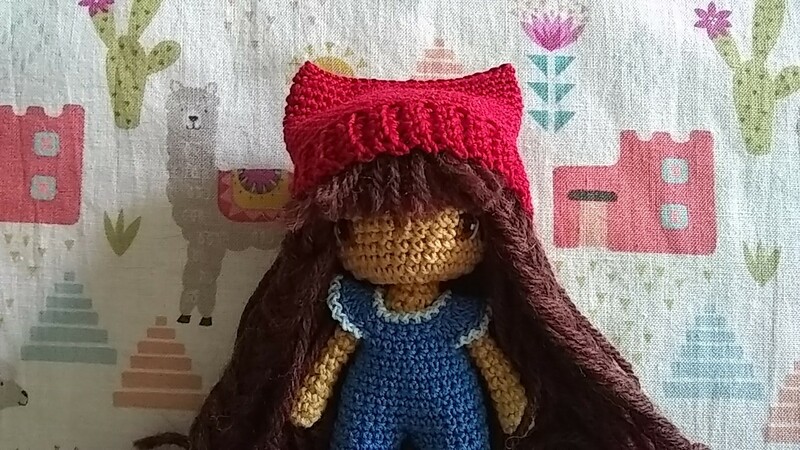 And for your crochet dolls, how about a remove-able wig? Once you've made the basic pattern, you can vary it to a short bob, long curls, even braids if you want. 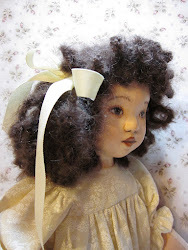 And again, once you understand the basic pattern, the wig can be sized for any doll, or use any yarn. How nice to have lovely, long hair that won't get tangled! Have a lovely day, and enjoy the crochet! 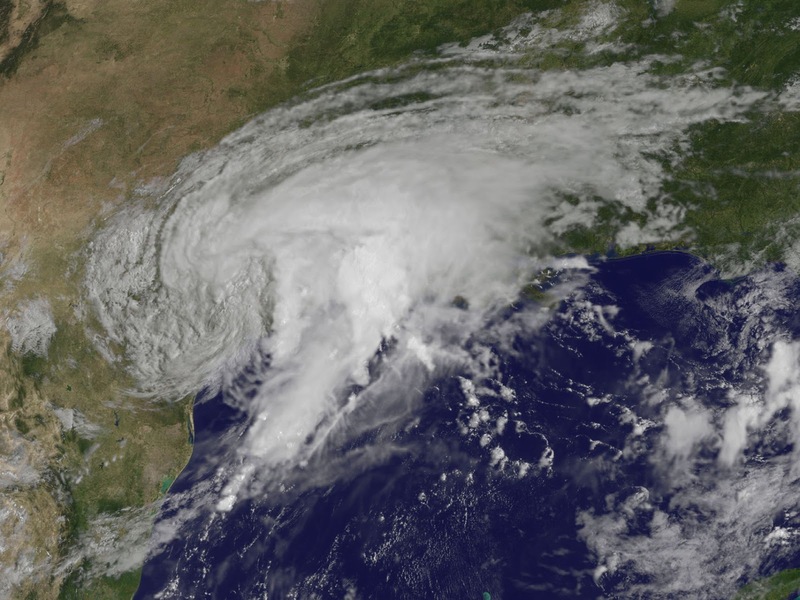 Images from the devastating rains of Hurricane Harvey bring the story of human and animal suffering into our homes. What can we do to help? 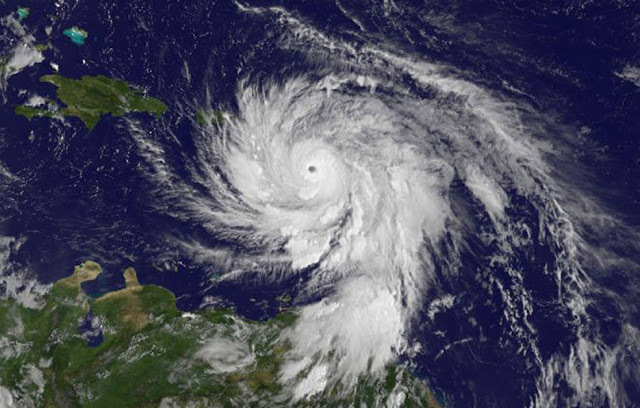 If you can, please consider helping. 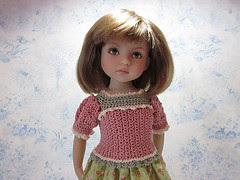 Violet is wearing a bit of crochet lace as a collar, and a simple gathered skirt. Charlotte is sporting pants and a crochet poncho, and Hannah wears a very simple pillowcase dress. All seams are 1/4 ". 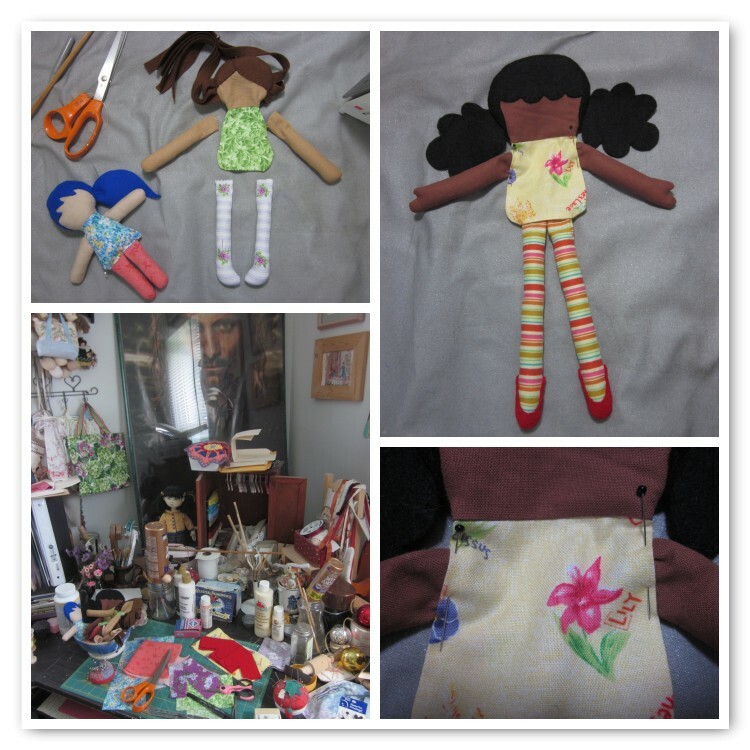 My dolls are about 10" tall, so you may need to adjust the size of the pattern for your own doll. But, as you can see, these are just squares and rectangles, and the fit is loose and forgiving. The skirt and the pants are a simple rectangle, as shown by the upper left and upper middle images. To make the pants, cut two rectangles 5 1/2" wide by 5 3/4 " long. Mark the casing line at the waist 3/4 " from the top, and the hem for the pants 1/2 " from the bottom. Find the midpoint between the legs and mark the crotch cutting line 3" from the bottom of the pants, shown in the upper right image. Don't cut this line yet; sew the crotch seam as in the lower middle image, then sew the side seams. When sewing the crotch seam, as you get close to the turning point, change your stitch length to a very short one and take it slow around the corner. Carefully cut along the crotch cutting line, and clip the corners of the crotch seam close to the seam. This will let you turn the pants right side out and smooth the wrinkles out of the seam. Lightly ironing this also helps. Press down the casing line at the waist and press up the hemline at the bottom of each leg. Sew the casing by machine 1/2" from the folded edge, leaving an opening at one of the side seams to insert the elastic. 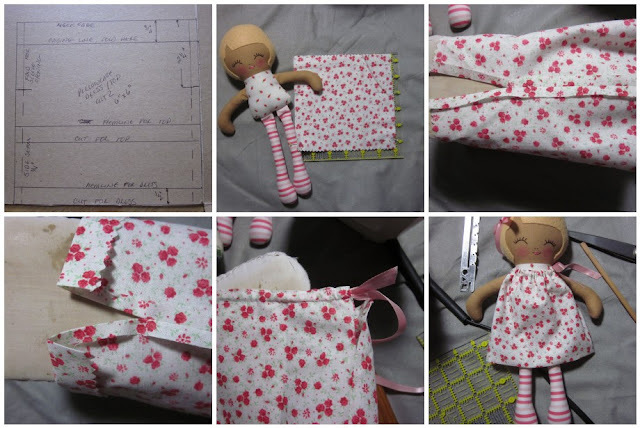 Use 1/4" or 3/8" elastic and wrap it around the doll's waist, with about 1/2" overlap. Insert the elastic into the casing with a safety pin and work it around the waist. Sew the overlapped ends of the elastic so it lays flat in the casing, then handstitch the casing opening closed. Hand sew the hem with matching or contrasting floss. Done! The skirt is even simpler. Cut your fabric 12" by 4 1/4", sew up the center back seam, press under the casing at the waist and the hemline, then sew up the casing as in the pants, insert the elastic, then hem the skirt. The pillowcase style dress has to be the simplest dress in the world to make. Cut two pieces of fabric 6" by 6". Sew the side seams up to 2 1/4 " from the top, then press the seam open, pressing open the unstitched 2 1/4 inches to make finished armhole openings. Press the casing at the neckline down 3/4 " and stitch the casing in place 1/2" from the folded edge. Do this on both the front and the back of the dress. Insert ribbon into the casing with a large tapestry needle and run it all around the neck edge. You can use one piece of ribbon, like I did, or use two pieces and make bows on both shoulders. Turn up the hem and handstitch in place with embroidery floss, and you're done! You can use the pillowcase dress pattern to make a very simple top to go with the pants and skirt, or make rompers out of it by lengthening the pattern a bit and making a crotch seam as for the pants. Chain 48, join to form a ring. In the ring work (3dc, ch1)eight times, (3dc, ch2, 3dc, ch1) once (front point made), (3dc, ch1) eight times, (3dc, ch2, 3dc, ch1) once (back point made). Join to the first dc. Slip stitch in the first two dc, then work (3dc, ch1) in each ch1 space, and (3dc, ch2, 3dc, ch1) in each ch2 space. this will create a point at the front and the back of the poncho. Work until it is as long as you want; I think I worked 10 rows. The first thing one notices about a doll is its face. And faces tend to intimidate dollmakers, but they shouldn't. When you make your doll's face, it comes alive and has the power to tell you stories. A face can be as simple and as charming as two dots for eyes, and nothing more. 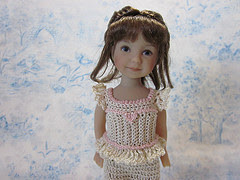 Illustrations by Joan Walsh Anglund have this look of innocence, and a lot of dollmakers use only this to create very endearing dolls. But you can be a bit more daring, and create a more expressive face, and that is what this post will show you how to do, step by step. The right tools make a big difference in the ease of what you do. I use a Pilot Frixion erase-able marker to mark the features on my dolls. The beauty of this pen is that, if you don't like what you've marked, a warm iron will take the marks completely away, and you can start again! Feature placement for your doll is important. I prefer my doll's features to be in the lower half of the face. This gives a more child-like appearance to the doll. So first (image at the top left) use two glass head pins to locate the eyes, then use an orange glass head pin to mark the mouth. Move the pins around until you get a symmetry of features that is pleasing to YOU. Then, make a small dot at each of the pin points. Carefully trace an even circle around the two eye points, then draw in the eyeliner and eyelashes. Next, add eyebrows, and finally, the nose and the mouth. The mouth. This is always the hardest part for me, but I've found the sweetest and simplest mouth is a single line for the lip parting, then two shorter lines above and below this for the lips. And finally, in the last image (bottom right) your face is drawn! 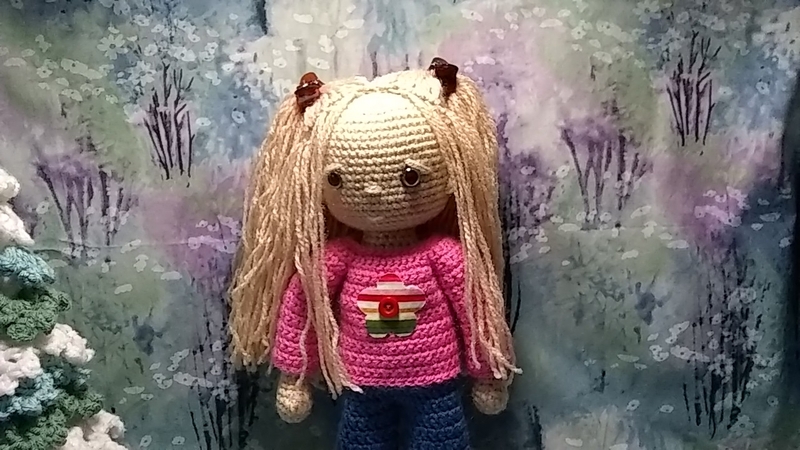 I like to embroider the faces on my dolls, mainly because I have much more control with a needle and thread than a brush and paint :-) And their are SO MANY floss colors to choose from! For Daisy, I used DMC 926 for the eyes, DMC 817 and 350 for the lips, nose, and eyebrows, and black and white for the eye detail. All of the stitching was done with two strands of floss. Satin stitching the eyes does not have to be hard, but you do need to go slow and take care. The best way to do this is to first outline the eye with an outline stitch, as in the bottom left image, then begin satin stitching across the eye, beginning in the middle and working to the bottom, then working from the middle to the top. Now you have a nicely worked satin stitch eye. Add detail to the eyes with black for the pupil, eyeliner, and eyelashes. Work the pupil stitches over the satin stitched iris, as in the upper left and upper middle images, then use a stem stitch to make the eyeliner and straight stitches for the eyelashes. And finally, embroider the eyebrows, nose, and mouth. I used the same color for the eyebrows as her hair, which was DMC 817. Use the darker of the two lip shades for the lip parting line in the middle, again DMC 817, then the lighter shade for the lines that are the upper and lower lip, DMC 350. I also used the lighter shade to make the points for the nose. To blush her cheeks, use crayola crayon! The color I like best is Wild Strawberry ( in my box of 64 colors), but any appropriate shade of pink or peach will do. Rub the color into the cheek, then use a soft knit cloth (a clean pair of old undies will do) to rub the color into the cheeks and soften it a bit. And now you've created a lovely face for your cloth doll. D is for Daisy, in denim a delight. H is for Hannah, happy for hours. L is for Lucy, loving and loyal. O is for Olive, obstinate and ornery! P is for Poppy, personable and pretty. T is for Tansy, trusting and truthful. X is for Xanthe, an X-Ray technician! So, can I make 26 dolls from the Rita pattern on Mimin Dolls blog? All different, with names and characters from the Alphabet poem above? I have plenty of fabric, plenty of time, and right now, plenty of enthusiasm. 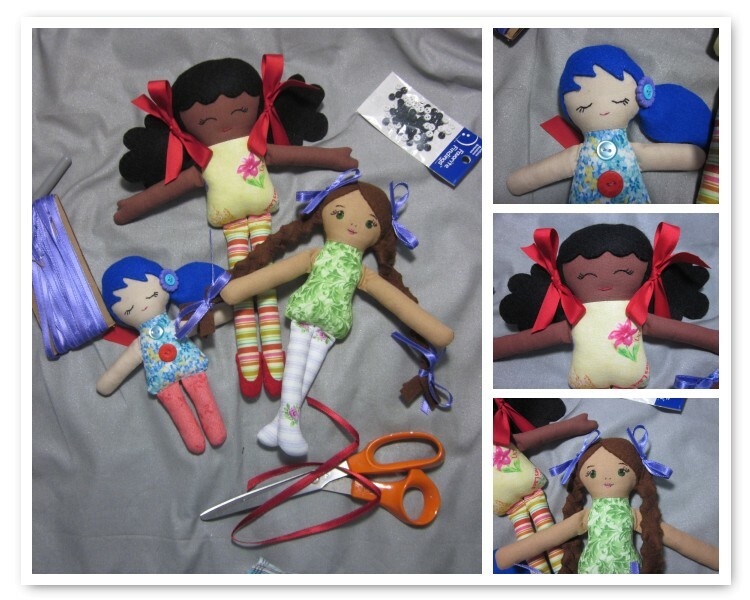 Four dolls are already made: Molly, Sophie, and Belle, above, and Daisy, below, who was just finished up this afternoon. 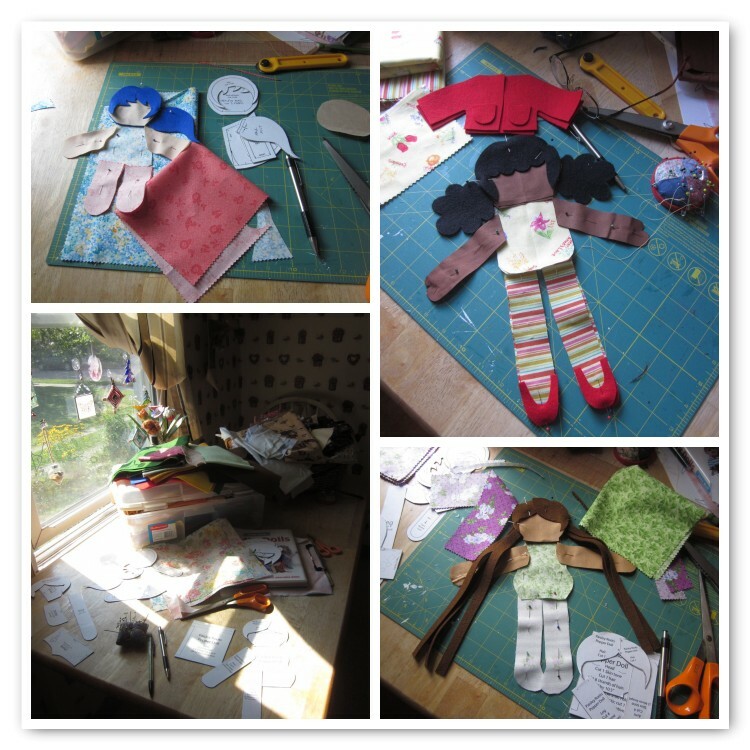 It only takes a day to make a doll; they are quite simple, and so much fun to dive into the fabric stash and pick the materials. 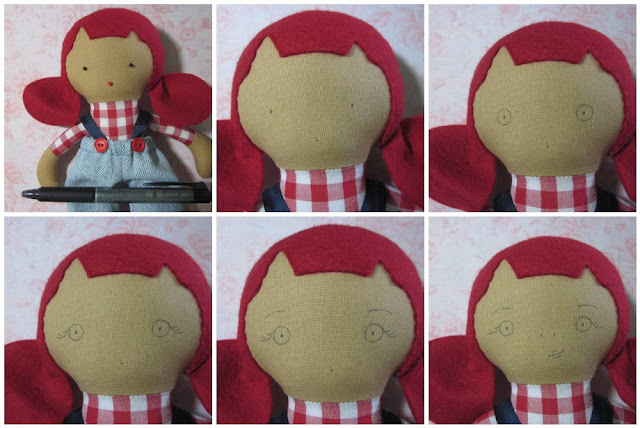 Along the way I'd like to share some tips and techniques that will make your cloth dollmaking experience a joy: how make faces, how to stuff bodies, how to keep from chewing up your fabric in the sewing machine, and anything else I can think of. Maybe challenge yourself to make some alphabet dolls, with your own favorite pattern, and using your favorite names. Enjoy! The internet is an amazing source of ideas and inspiration for dollmakers, not to mention a great place to find free patterns! The three dolls above were all made from patterns made freely available by their creators. I got turned on to fabric dolls (again) by a friend from the Hitty's Knittys Yahoo group, and went searching for dolls with sewn on felt hair. 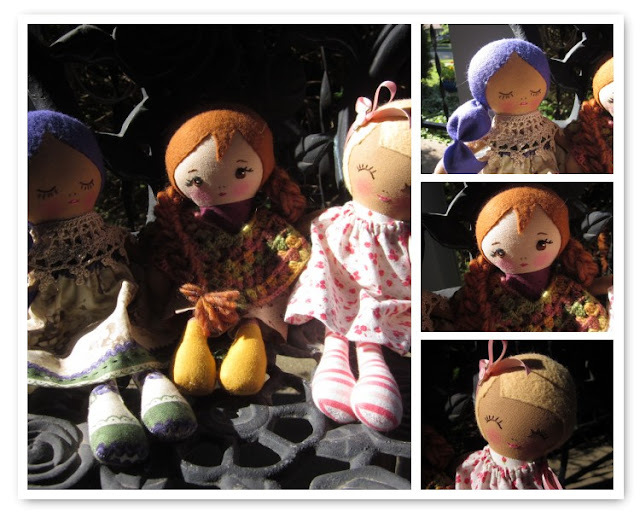 One great place to look is Pinterest, where I found the links to these three dolls. Josephine, the doll with blue hair, from the blog While She Naps. Lily with the red jacket, from the blog Make It, Love It. Putting it together, in a rather messy workroom! 5. then ladder stitch the legs to the body. This was much easier than trying to fit the limbs inside the body, then stitch the body and turn it all right side out. Also, I reduced the pattern sizes for these dolls. One of the nice things about patterns online is that you can easily alter the size of the doll when you print the pieces out. Josephine and Pepper were both reduced to 50%, and Lily to 75%. Once the face is added to the doll, they come alive! They tell us their story, whether they are shy or outgoing, adventurous or bookworms, or both! These dolls were very easy to make, and made up fast. 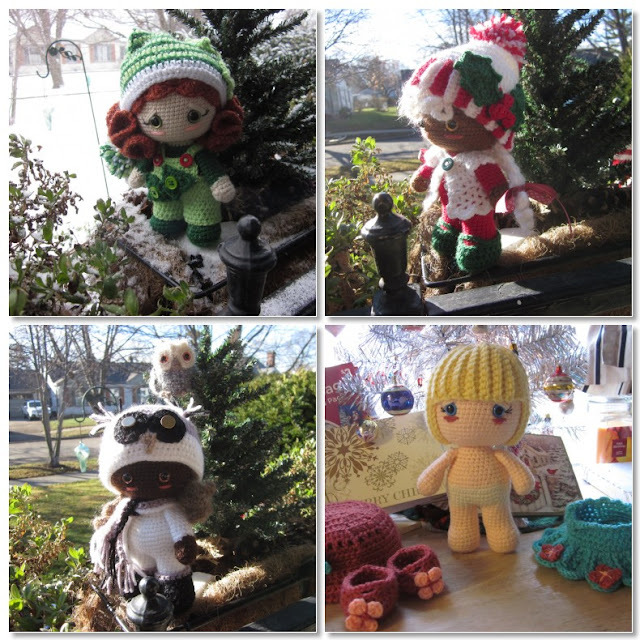 After they were done, I found one more free pattern, which I liked best of all! Molly is about 10 inches tall, from the Rita pattern on Mimin Dolls blog. 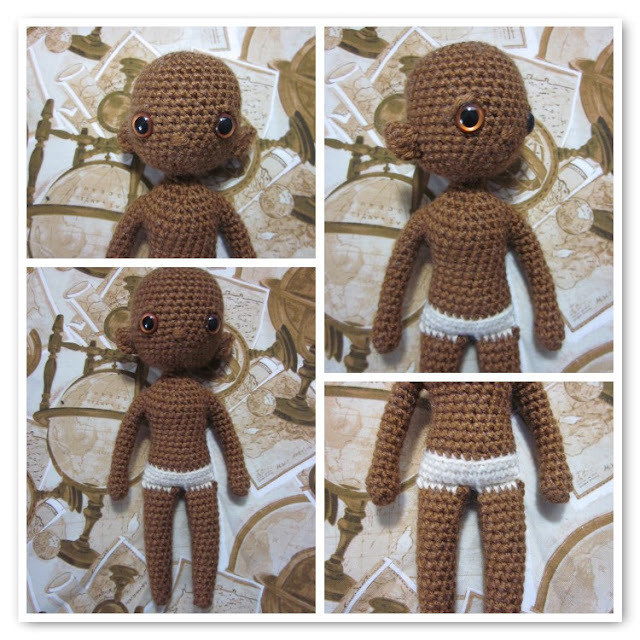 There are no instructions for the doll, just the pattern, but these dolls are so simple that they are pretty self explanitory. I increased this pattern to 115% when I printed it out. 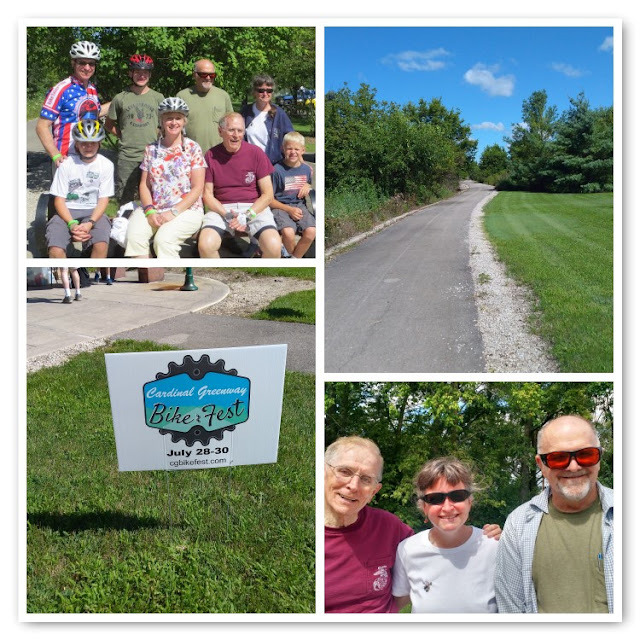 Saturday most of our family participated in the Great Greenway Tour, along the Cardinal Greenway in Delaware county, Indiana. The greenway is a wonderful Rail-Trail that stretches almost 80 miles, from Marion to Richmond, and all but 15 miles along the railbed. It was a pure joy to ride in the country, enjoying the rolling and fertile farms. The day was perfect, cool and dry with a beautiful blue sky. My brother and sister-in-law, our nephews, my Dad, Larry, and I did 13 miles, then came home to enjoy carryout pizza! our youngest nephew leads the way! Make it with size 20! If you like a somewhat more delicate look to your tiny crochet, consider using size 20 crochet cotton, or DMC perle size 8. I work these threads with a size 9 hook, and it really is not much more difficult than size 10 thread with a size 7 hook. It just takes a little getting used to. The advantage of size 20 is more detail in your crochet, and also better drape in the garments. What I want to share today is a pattern for some basic garment elements, but not a complete dress. Why? Two reasons: you can use your own creativity in making a garment, as long as you have the basic fit of the bodice. Secondly, the dress is not my original idea, but one I fell in love with on Pinterest. 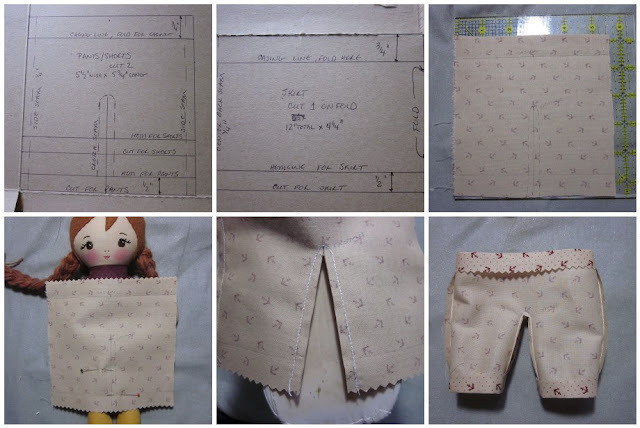 The bloomers and camisole are my own, and include full instructions. About once a year I get bitten by the cardboard box bug...hate to throw them away! It is inspiring to look around and see how many different things can be made with cardboard boxes. With the advent of multi-colored duck tape, the construction ends up being tidier, easier, and pretty good looking. Of course, you don't want to sit on your construction...or leave it in the rain... or throw it at your annoying sibling. 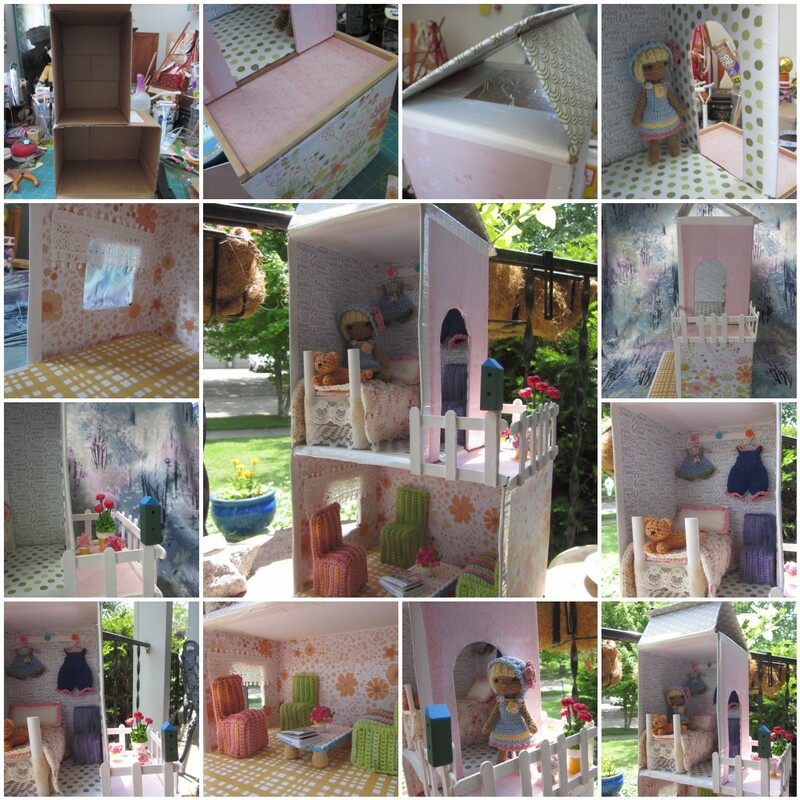 But if you play carefully, you can have a dizzying array of doll houses for pennies, and a bit of your time. 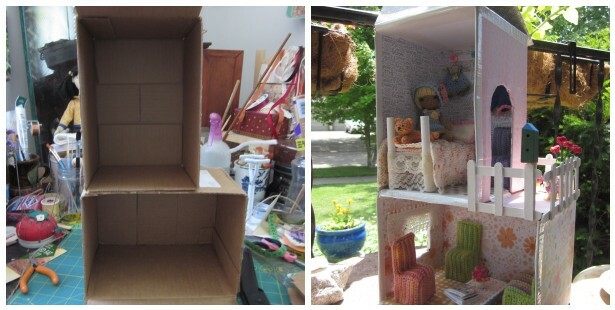 This two room cottage for Mini Hitty was made with boxes we get our vitamins in. Since they come monthly, I have an impressive stash of boxes; probably enough to make a village! In addition to the boxes, I used scrap book papers and colored duck tape, both from Michaels. Modge Podge for glue, and a couple of old paint brushes to apply the glue with. I papered the ceilings first, then the walls and finally the floors. I also papered the outside, then taped the first floor to the second floor with white duck tape. I used the duck tape to cover all the raw edges of the cardboard. If the tape was too wide, I laid it on my cutting mat and sliced it with my boxcutter the width I wanted it. To support a craft stick fence on the balcony, I used lengths of basswood glued to the edge of the balcony, for the fence to then be glued to. The bed is made from four clothespegs glued to a cardboard frame the size of the mattress. To make the mattress frame stronger, cut two pieces of cardboard and glue them together, then glue on the clothespegs at the four corners of the bed. One side of the peg is sawed off, so the frame fits onto the stub of the sawed off peg. The bed is dressed with stash lace for skirting, and Warm&Natural cotton batting for the mattress and pillow. The coverlet is knit. I added a peg rack made from a craft stick, with tiny wood spools as the pegs, covered with colored mini buttons. Mini Hitty can hang her clothing here. Two box flaps were cut down to half size and used for the barn doors. Another box flap was left in place and trimmed to look like the gable front of the barn roof. 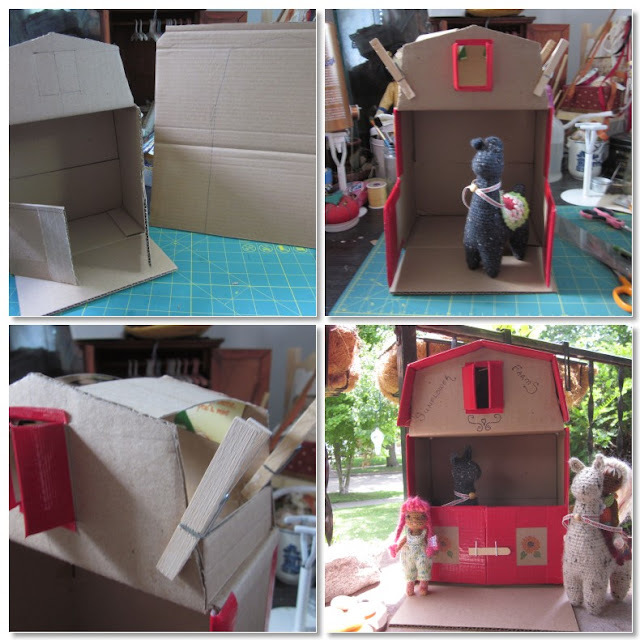 I used a separate piece of cardboard to make the back side of the barn and roof; cut the top to the same shape as the front gable of the roof, then glue this piece of cardboard to the back of the barn box. Instead of scoring the cardboard for the roof, I used the edge of my work table to crease it, then glued it to a cereal cardboard rafter.